I have been receiving quite a few ascension messages this month. The best one, by far, came while I was meditating with God Source. The vision I was shown indicates that our consciousness has expanded sufficiently to reach 5D levels. We are bursting at the seams awaiting the transitional event that will set us free from our 3D confines. Once released, we will quickly ascend into the fifth dimension. There, we will live in perfect harmony with nature on a pristine Earth, feeling completely loved and safe. Permanently freed of our lower vibrational concerns, fears and trauma, we will enjoy a joyful childhood renaissance, filled with wonder, beauty, magic and joy. The vision begins with Steve crammed inside a small Plexiglas box. Although the walls were semi-transparent, they are very thick, restrictive and sound dampening. They also distort his view. Suddenly, he is freed of his prison. Steve stands up and begins to stretch his arms and legs. He also begins to grow taller. He keeps growing until he is 15 feet tall…but he looks like a little boy! Then, his legs turn into a plant stalk. The stem keeps growing. As tall as he is, Steve the Plant is in perfect proportion to his surroundings; everything is taller. To support his height, Steve’s roots grow deep into Earth where they tap into an aquifer of sparkling pure water. Above him, Father Sun is beaming his golden light, causing Steve’s petals to unfurl. He blossoms into a happy, smiling daisy. In the second part of the vision I, too, was trapped in a small enclosure. Instead of a Plexiglas box, I was inside a giant steel clamp which resembled a Panini press. My body was sandwiched painfully into a very small, dense form. Then, the clamp flew open, and I was set free. Like Steve, I grew swiftly into a giant version of myself. Up and up I went until I was on 5D Earth. Once I had stopped expanding I was 12 feet tall. I looked around and saw that I was in a pristine, lush green environment. My adult self then transformed into a little girl, and I was filled with immense, irrepressible joy. I started skipping and jumping around. That’s when I noticed I was carrying rainbow-coloured pinwheel. As I gleefully pranced, I reached up with my pinwheel and, much to my delight, it created rainbows in the sky. I continued to dance and touch the sky with my magical rainbow wand. Plexiglas box and The Metal Clamp / Panini Press: These man-made devises represent the third dimension with its confining, dense atmosphere and a proliferation of technology. Growth and Tall Stature: These symbolize the re-expansion of consciousness. Our giant stature also matches the height of people in the fifth dimension. Flower Child and Daisy: Steve literally turned into a ‘flower child’, the nomenclature of the idealistic teens of the 60’s. The Hippies planted the seeds of ascension, and we are harvesting them. The daisy was shown because it represents a return to innocence. Roots: In the fifth, we are an integral part of the ecosystem, and we live in harmony with all life. We are deeply rooted to Gaia, who sustains us with life-giving energy. Sun: Just as the flower’s growth is facilitated by the Sun, so too is our spiritual awakening and evolution. The Sun is responsible for fueling our collective ascension. Pinwheel: This simple toy is rich in symbolism. It represents a return to childlike joy, playfulness, innocence and carefree living. It also stands for positive transformation; good fortune; good health and longevity, all of which we will have in the fifth. Additionally, its spinning rotation resents both interdimensional vortex and the MerKaBa, our ascension vehicle. Rainbows and Rainbow Child: Rainbows symbolize our rainbow lightbody, as well as the magical land that is 5-D Earth. 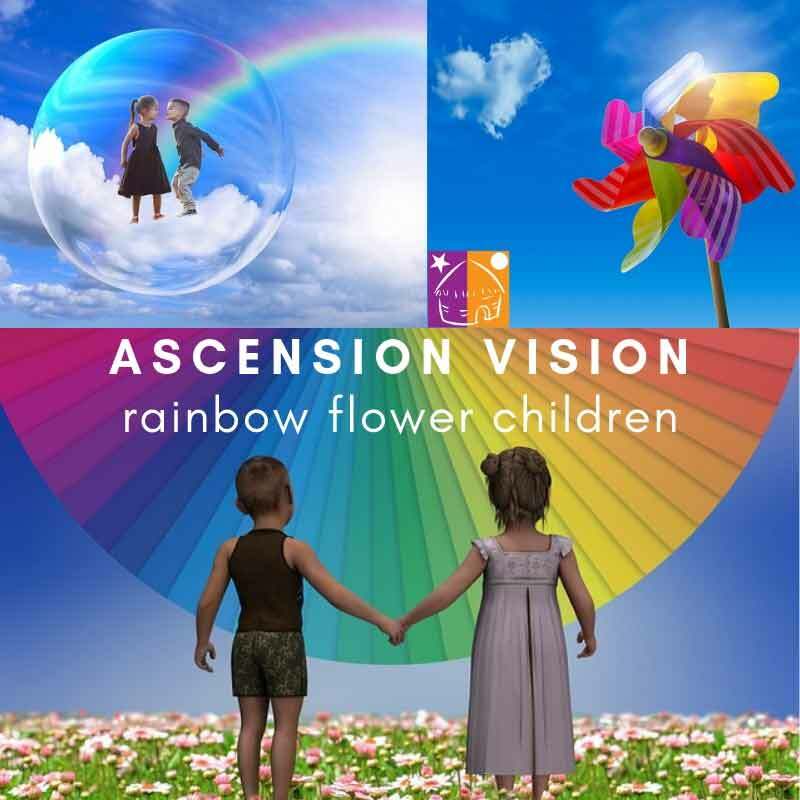 The term ‘rainbow child’ refers to the wave of new kids who are here to assist with the ascension. Some are starseeds from highly evolved planets and others are higher dimensional souls. Summary: No matter how you interpret the vision, it is a good one! The images were so vivid and pure, and the joy was palpable. You resonate to all that energy or else you couldn’t have channeled it! And now, thanks to your sharing, we all get to resonate there, too! Thank you, my sister, for this magical vision in the season of Love and Peace! Big hugs! Thank you so much, Soul Sister! I always love hearing from you. That vision was definitely for you, too. There’s lots of magical energy around these days for us to soak in. I wish you peace, love and joy! xoxo Lots of love!